Making good paella is not difficult and is greatly enhanced when you use a good stock made from scratch. Stock made from scratch does take longer but, you’ll be rewarded with robust aromatic flavor with a lot less sodium. Using canned chicken or vegetable stock is quick & easy but, the over whelming amount of salt will throw off other delicate flavors. 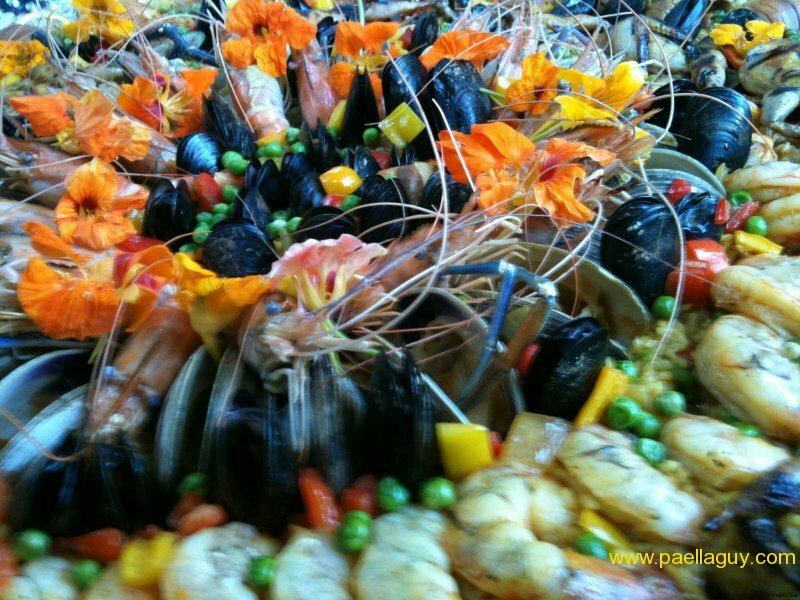 Water on the other hand will dilute your flavors from the various ingredients used in the paella. The key is making your own, watch the salt and try using different versions to control the flavor profile. How to make stock for paella from scratch. Combine all ingredients except the saffron in a large stock pot and bring to a boil. After reaching boil, turn heat down to maintain a gentle simmer for 2-3 hrs. If necessary simmer longer until the pork trotter is super soft and has released its gelatin and the stock has a silky almost creamy texture. 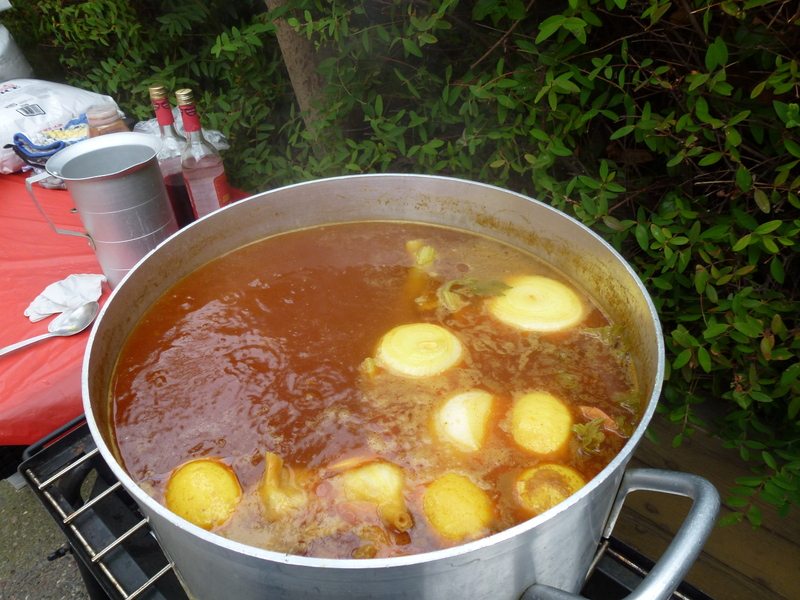 Usually I will prepare the stock a day in advance and finish it off the day of the paella. Once ready, remove all the solids, strain if necessary, and add your saffron. Make sure to grind saffron into a fine powder prior to adding to stock. I prefer this method because all the chemicals ( crocin, picrocin & saffranal) that give saffron its color and aroma will render more freely. After simmering 4-6 minutes, stock is reading to be used on your paella. 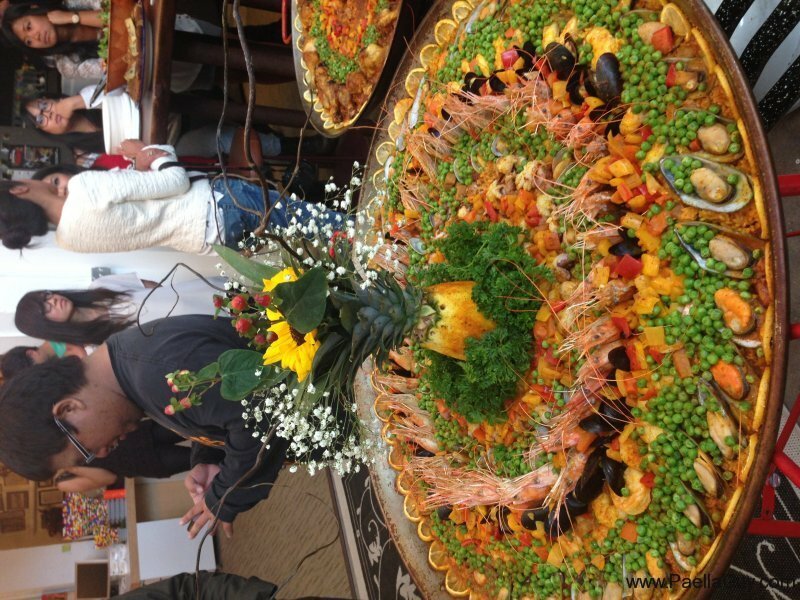 What is the “X” Factor in Paella? Short answer is everything in moderation. What do I mean? To truely make a great paella, you have have to build flavor depth with each set of ingredients being used. Fresh is preferrable, homemade is richer than canned, and a little know-how doesn't hurt either. 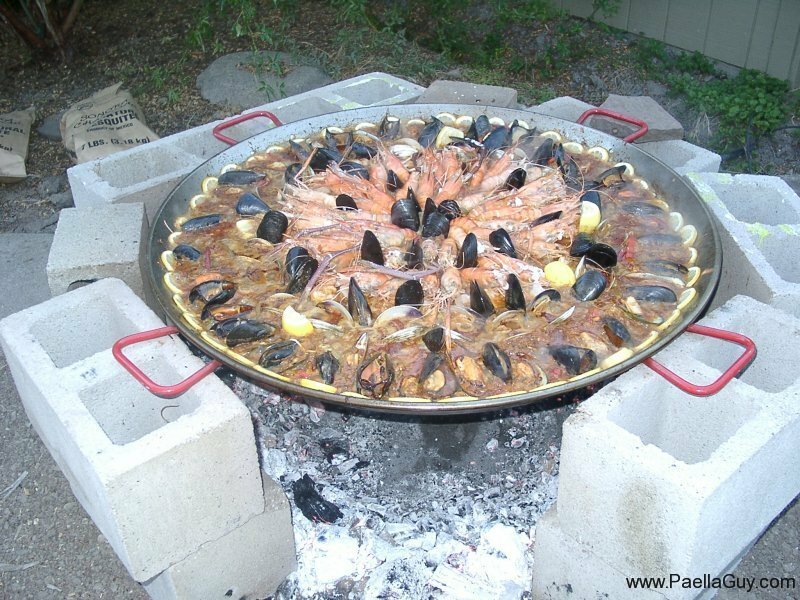 You can make paella on just about any shallow pan but, a true paella pan, also called a paellera, performs best. Surface area versus depth is the key and keeping the rice at about 3/4 of an inch yields the best performance. We don't want to get into an explanation of heat distribution and thermal-dynamics but, let's just say that a large evenly heated surface area is your best friend while preparing paella. Flame heat needs to be constant, most paella burners are too sensitive and even the slightest breeze will affect how your paella cooks. Equipment is important. Later we'll discuss cooking paella over and open fire, could be lots of fun or a big disaster. A softrito is basically a concentrated sauce used to flavor the paella. Many cooks don't use a sofrito, personally I use it every time and am always looking to improve on it. I call my sofrito the secret sauce, we all need to have one. Later I will share my sofrito recipe but, for now let's just say that the sofrito adds unlike any other ingredient used in the paella. The sofrito will permeate the rice, seafood, and vegetables used. It will develop that basic flavor profile and set the tone; spicy, salty, savory or umami. Sofrito is your friend! Vino is good for drinking but, I use it quite extensively when I prepare paella. Mostly I like whites and any will do: Chardonnay, Sauvignon Blanc, Riesling, Pinot Grigio and even sparkling. I say that sofrito is half of the secret sauce and vino is the other half. Wine does a couple of things, it imparts a little tang to the paella and the acid from the wine helps to cut the oil and grease from the various meats used. Not to mention that when I pour the wine into the pan, the resulting sizzle and steam is an olfactory symphony to the senses. Most people near enough get weak in the knees with the smells of onions, garlic, spices combined with wine, its to die for. Hence vino is good for cooking and drinking with paella. Take stock of this, I never use canned stock to prepare paella, it is way too salty and is void of real depth and flavor. Same for plain water on the flavor side. I start my stock with the basics: onions, garlic, celery, cilantro and saffron. I like putting the saffron in the stock because it has a better chance of stewing and releasing all its rich vibrant color over a longer period of time. On the protein side, I add chicken bones, fish parts and guess what? Pork trotters! Why? 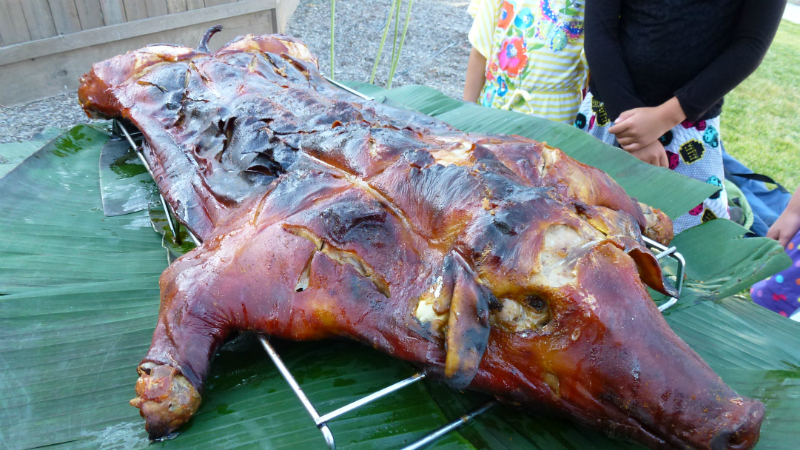 Because pork trotters are full of collagen and provide much structure and consistency, you can almost chew through the flavor imparted by the trotters. Little secret! I also add pineapple to the stock to add a little acid and sweetness from the natural sugars. Recipe will follow later. Almost little to no salt is used, that will come from other sources. Fat is good if used appropriately and sparingly. 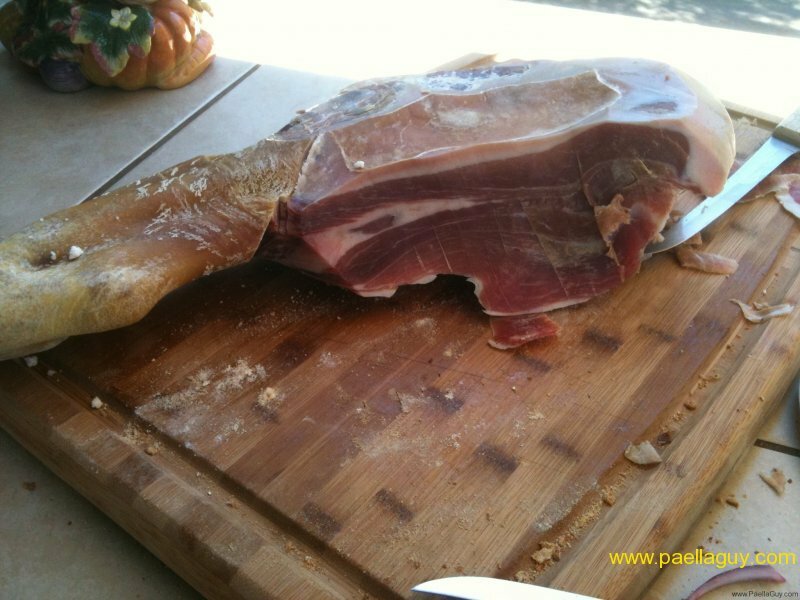 Since I cure my own jamon (Sonoma Serrano), I have access to beautifully marbled "lardo". For those of you not familiar with lardo, it is basically cured pork fat and can be eaten as, although it needs to be sliced very thin. In our case I add chunks of Sonoma Serrano Jamon to the onions and garlic as they saute. This step adds succulent flavor that permeates throughout and adds richness to the overall texture. So there you have it: paellera, sofrito, vino, stock and fat. 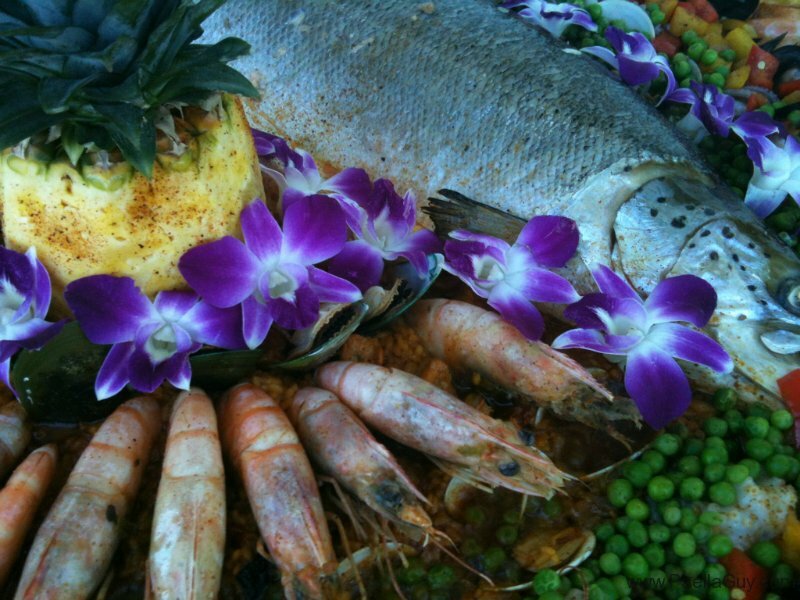 The flavor base that supports the rice and all that succulent fresh seafood. Done right, the base will reach long and wide while rewarding you with a super flavorful paella. Checkout my basic recipe for additional details, Salud!